Srini Raju, the founding CEO of Cognizant, has moved on to helping numerous professionals realise their entrepreneurial dreams. Around 100 companies from 25 countries have so far announced investments totalling Rs 12,500 crore in Sri City, a 7,000-acre stretch close to the Andhra Pradesh-Tamil Nadu border. Even in the last 100 days, despite Andhra Pradesh being in turmoil over the carving out of a separate Telangana state, Cadbury, Pepsi and Japanese auto major Isuzu have declared their intention of investing Rs 1,000 crore each in Sri City - and that's just the first phase. Land, water and power are all in plentiful supply here; Chennai is just 50 km away and Bangalore, 200 km. The man behind the creation of Sri City, one who attends many of the inauguration ceremonies of investing companies but rarely steps into the limelight, is Chintalapati Srinivasa Raju or Srini Raju. "In late 2005, I attended a conference in Delhi on urbanisation," he says. "The Central government said it wanted to create new hubs of economic activity. I was inspired by what I heard. For six months, along with Ravindra Sannareddy, my friend and business associate, I scouted locations and finally settled on this one in Chittoor district." The state government agreed and Raju took the first step of investing Rs 100 crore in the project. By 2009, Sri City was up and running. 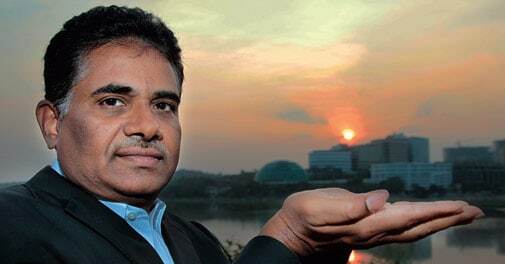 Sri City, however, is only the last of a series of prescient investments made by this man with the Midas touch. 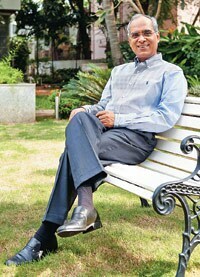 With a Masters degree in civil and environmental engineering from Utah State University in the US, Srini Raju started off as an engineering consultant there, but subsequently, in the early 1990s, came back to India to join Satyam Computer Services, founded by his close relative, B. Ramalinga Raju. As chief operating officer and director of the company, he soon began to play a pivotal role there. In 1994, he also became CEO of a new company Satyam set up in a joint venture with information company and credit rating agency Dun & Bradstreet Corporation called Dun & Bradstreet Satyam Software Pvt Ltd, the former incarnation of Cognizant Technology Solutions. In 1997, he formed a sister company Satyam Enterprise Solutions, focused on telecom, enterprise resource planning and other Internet technologies. In October 1999, Satyam Enterprise Solutions merged with Satyam and Srini Raju moved out of Satyam altogether, eight years before the notorious Satyam scam broke. Thus began his career as an investor. "Over a period of time, I sold all my shares in Satyam and that gave me the Rs 150 crore kitty I started off with," he says. It was the first wave of the Internet boom and Raju was keen to fund next generation technology companies. He set up iLabs Venture Capital Fund to incubate promising start-ups, which gradually transformed into an institutional fund, called Peepul Capital Advisors. "My goal was to turn motivated professionals into successful entrepreneurs," he says. In the last 14 years Raju has funded around 40 companies, a number of them emerging as leading players in their sectors. He currently manages around a billion dollars across three funds. The first of Raju's unconventional investments that hit the mark was the animation company, DQ Entertainment, in 2000. It then had just a handful of employees; today it has 3,000 and is listed on the Alternative Investment Market (AIM) of the London Stock Exchange. "Srini Raju was our first PE investor," says Tapaas Chakravarti, Chairman and CEO, DQ Entertainment. "He followed it up with a second tranche in 2005." In 2007, Raju exited DQ with returns close to three times the investment. A second big success has been Cibernet - since renamed MACH - which is now the world's largest roaming data clearing house for telecom companies. Investing around $1 million, again in 2000, Raju exited in 2006 with returns similar to that from DQ Entertainment. A third was Associated Broadcasting Company (branded TV9), a TV company Raju backed in 2003, which now has seven channels, four of them leaders in their respective states. Raju began with Rs 15 crore, and kept raising his investment to reach Rs 50 crore. In 2006, he invested in MedPlus, a chain of pharmacy stores. MedPlus then had 60 outlets, now it has 1,070 and is the biggest such chain after Apollo. Then there is the mobile stores chain Univercell, in which Raju invested in 2007. "Srini makes you think big," says Univercell founder Sathish Babu. "I had just 10 stores in the first 10 years of Univercell's existence, but added 100 more in five months after he came in. Today we have 450 stores and are the second largest such chain in the country after 'The Mobile Store'." There have been occasional wrong calls too - such as the one Raju made in a bioinformatics company or another in a firm making dirt cleaning equipment. Neither of these took off. But overall, it is an astonishing record of picking winners. Raju's net worth is currently estimated between Rs 2,500 crore to Rs 3,000 crore. How does he go about deciding which companies to support? "My investment thesis is simple," he says. "The company should have professional managers and should be light on assets, typically from technology, health care, consumer products or services." Those who have known him well wax eloquent about his abilities and temperament. "Srini Raju is a savvy businessman who has shifted his strategy from seed stage investing to investing in mature ventures and entry into real estate," says Sarath Naru, Managing Partner, Ventureast, a leading VC fund. Lakshmi Narayanan, Vice Chairman, Cognizant, who worked closely with Raju during the early years of the company, offers more insights. "He is very entrepreneurial," he says. "Once he gets something started, he loses interest in it, and wants to move on to the next thing." Indeed, Sri City is his current obsession. "I want to see it emerge as the most liveable city in India, using sustainable energy, 100 per cent recycled water and with most residents travelling by public transport to work," he says. How does he respond to critics who claim the project succeeded primarily because of Raju's closeness to the former chief minister of the state, the late Y.S. Rajasekhara Reddy, and his son Jagan Reddy? "Several leading investigating agencies which have looked into the affairs of Jagan Reddy have found he has no connection with us," he says.